Early News Items have now been archived. The September 2018 Village News: The latest quarterly PDF version of Issue 103 of Village News is now available on line: Click Here. Click Here. Minutes are only published after approval, usually this is at the following months meeting, but can sometimes be longer. Please note that there was August 2018 Parish Council Meeting. Full Minutes List Here. 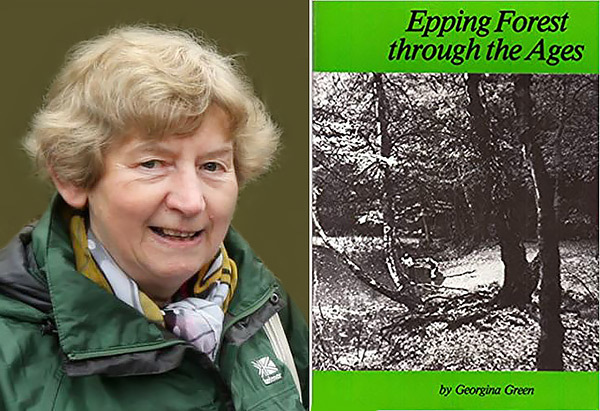 Around 30 people attended last nights Theydon Bois & District Rural Preservation Society free talk at Theydon Bois Village Hall when historian Georgina Green regaled her audience with the story of "Epping Forest Through The Ages". 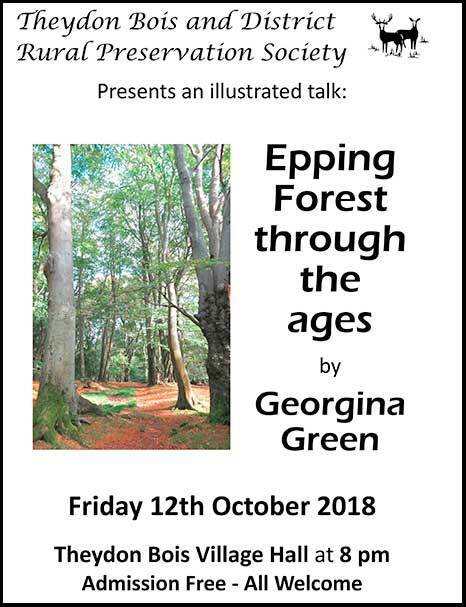 For those interested in the history of Epping Forest and who missed the talk you can read Georgina's book, that was first punished in 1983, as a free pdf available on line here. This was the last TB&DRPS talk of 2018, but more are planned for next year along with a new walks programme. You can keep up to date with the society's activities on their web page and if you would like to join the Society Committee you would be very welcome. Please contact one of the officers listed on their page. 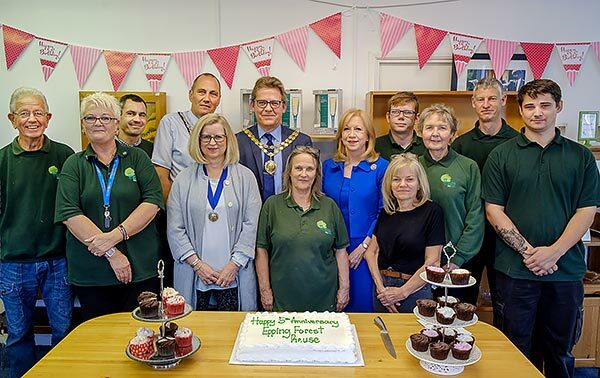 Epping Forest ReUse Centre celebrated its 5th Anniversary today with an open day with tours of the centre plus tea and cakes for all who attended. 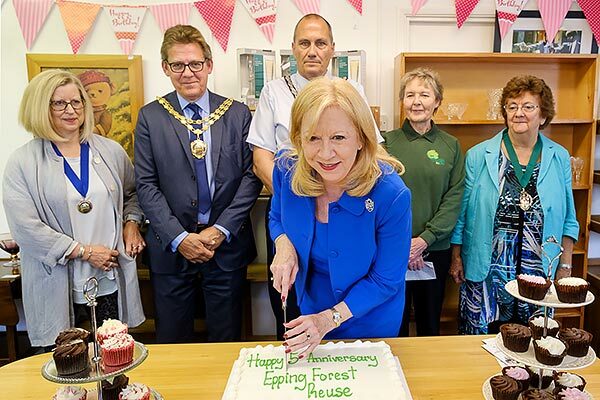 This afternoon Epping Forest MP Dame Eleanor Laing accompanied by Epping and Loughton Mayors cut the special anniversary cake and praised the centre and its volunteers for their work. Epping Forest (EFRU) is a charity and not-for-profit social enterprise based in Bower Hill, Epping. It opened its doors for the first time in April 2013 and has quickly established itself as the ‘charity of choice’ when residents are looking to dispose of good quality furniture and other household items to help the local community. The idea came from Janet Whitehouse, Epping Hemnall EFDC Councillor, Theydon Resident and Centre Trustee (3rd from right in above photo) who saw good furniture put out in front gardens to go to the tip when she knew many people were in need of it. Dame Eleanor Laing MP said: "The ReUse centre is one of my favourite places. The concept is absolutely brilliant. Some people are fortunate enough to have furniture and household goods which they no longer need, other people are in great need of those very items, and the wonderful thing about the ReUse Centre is that it brings everyone together for the good of the whole community." She added: "It's good for the environment because furniture and electrical items are not thrown away and it's good for those who are having hard times because they can come here to get the necessities to furnish their homes and look after their families". The Centre pride themselves in providing not just help in a crisis with material items, but help with rebuilding lives, getting people into training and back into work. The work they do is supported by a dedicated group of volunteers who are much appreciated. Many of their volunteers have been able to move on to full or part time employment since they opened. Of those purchasing items from the centre, 52% of the customers were in need (claiming at least one of five ‘state benefits’). The target set by the charity commission is 25%. All of their support goes to people in Epping Forest District and surrounding areas. In 2017/18 they provided £116,009 of goods at a discount to customers in need, which was a 9.3% increase over the previous year. £11,319 of goods were provided free of charge and they give £25 vouchers to charitable agencies who have clients with special needs. Their work in 2017/18 prevented 210 tonnes of goods going as waste to Landfill - equivalent to 4306 2 seater settees! EFRU has a manager and 5 other staff, most part time, but could not manage without its volunteers. They take the phone calls to book deliveries, assist on the shop floor, do PAT testing and repairs, grant applications and promote EFRU. They have a list of the volunteers they need so please speak to them if you are able to offer help. There are 5 Trustees at present and a 6th will be added soon. EFRU is a charitable Incorporated Organisation, a new legal structure brought in to being in 2013 which means they do not have to register as a company. Their Annual Reports are filed with the Charities Commission. You can contact EFRU at http://www.eppingreuse.org.uk/index.html or by phone at 01992 578222. 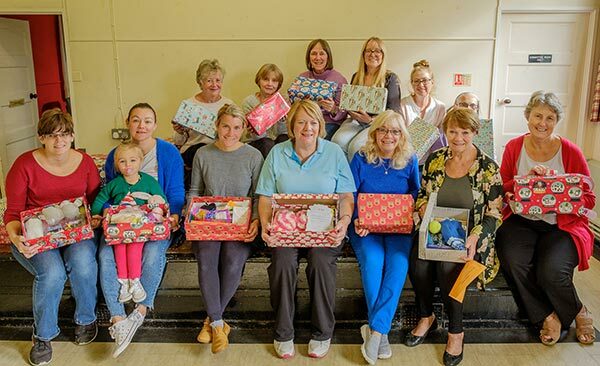 Many villagers, all ladies (not all are in photo above)where were the men, gathered in St. Mary's Church Hall one morning last week to prepare and pack shoe boxes for 'Operation Christmas Child'. St. Mary's has been sending shoe boxes full of gifts to to some of the worlds poorest children for over 30 years now. This year it is hoped to send at least 200 boxes again even though the cost of transportation to the receiving country is now £5.00 a box. If you would like to make a contribution to help with transport costs please contact Linda Hammond on 01992 81477. The Community Health and Wellbeing team at Epping Forest District Council have developed a new project called Epping Forest Community Champions. The Epping Forest Community Champions programme aims to build on the skills and knowledge of local people to create, happy, friendly and healthy communities. The team are currently promoting to recruit volunteer champions in each town/parish within the Epping Forest district to promote and improve the health and wellbeing of residents in the community. 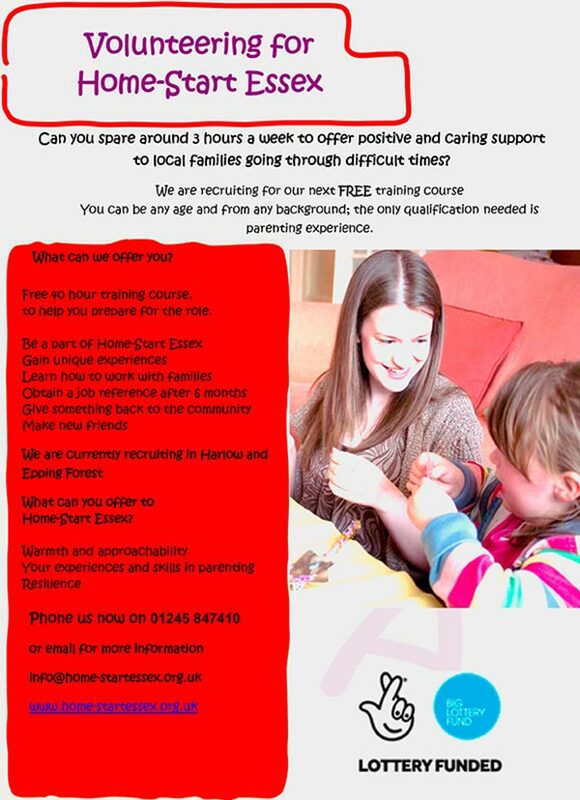 Do you know of a local resident who would be interested in joining us and making a real difference in the community? 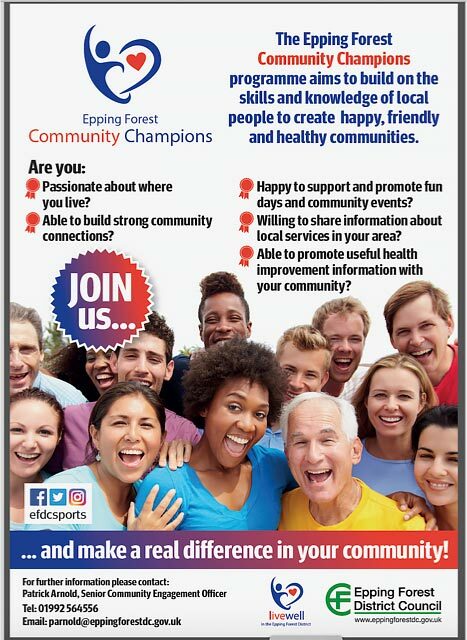 For further information on the Epping Forest Community Champions programme and details on how to apply please contact Patrick Arnold, Senior Community Engagement Officer. 7th October 2018: Theydon Bois Community Litter Pick: This was a special event that took place yesterday morning in co-ordination with others taking place across the country to help clear the scourge of litter and plastic waste from our village and the adjacent forest. Organiser John Eaton said that "it went off OK but we only had three additional volunteers, but a good turn out of the usual faces. There are now about fifteen very full sacks at the back of the Village Hall plus a road sign and plastic chair plus half of a very large sign advertising spectacles! Apart from the upper and lower greens and pond, the forest edge along Coppice Row, The Hoppit and Piercing Hill were also cleared as was the forest bit of Coppice Row and Piercing Hill to the Golf Club. The only Parish Councillor to support the occasion, Anthony Purkiss, who with one other volunteer, cleared the Abridge road from the top of the hill down to the Motorway bridge whilst two volunteers cleared from the railway bridge up to the top of the hill. One worrying problem was the amount of discarded fast food packaging waste material on the small green outside the flats opposite Buxton Road and scattered all over the place in the 'high street'. This must emanate from the take away food outlets. I will send an email to the Parish Council to get them to write to the owners. They either need bigger bins or need to clear up outside their shop at the end of the evening". Many villagers will know Russell Kemmish as his trade is as an Odd Job Man and most of his work is in Theydon, much of it for the VA and Parish Council for whom he has worked for nearly 20 years. Russell is probably even better known among village children as he is usually at the Donkey Derby as ‘Bubble Man’. 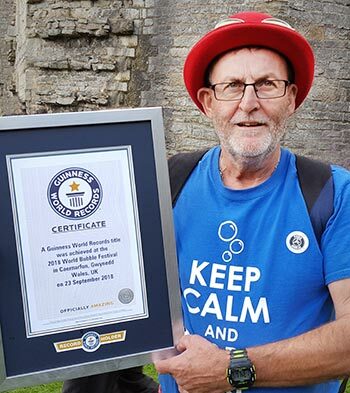 On the 23rd September Russell was part of a massive attempt to break 2 world records inside Caernarfon Castle. Russell is a ’Bubbleologist’ as they affectionately call themselves and Russell said “the record attempt was an awesome event with 80 bubble artists from all over the world as far apart as Argentina, New Zealand, Malaysia, Israel who were also joined by members of the public for the 2 Guinness World records which were both smashed". Guinness World Record Adjudicators spent the day with them as in total some 12 new world records were set, which will appear in the 2020 Guinness records book. "You really had to be in the castle grounds to fully appreciate the marvel of 318 people all blowing giant bubbles simultaneously. The castle grounds and sky were completely covered with bubbles of all shapes and sizes. The video below does not really do it justice". Russell was also part of a Guinness World Record for the most people simultaneously put inside giant bubbles, 27 at the same time. So in all he now really holds 3 Guinness World Records something he did not think would happen and which of which he is really proud. Guinness has not been brilliant at putting bubble records in their books previously but has promised a 2 page spread in their 2020 edition. There is a magic and science in the creation of bubbles and today ‘Bubbleologists’ try to outwit each other with a new trick, be it floating with helium or bubbles inside a bubble inside another bubble. Their imagination to do something different has no bounds. Russell was brought up in Theydon (his parents moved here when he was 1 month old) and he went to the Primary School and then Davenant when it had just moved to the district. He married Gill in 1982 at St. Mary’s Church. Gill worked at our Primary School as a teacher and then Special Educational Needs Coordinator for 31 years in total. Russell started blowing bubbles some 40 years ago, but only returned to it 8 years ago. 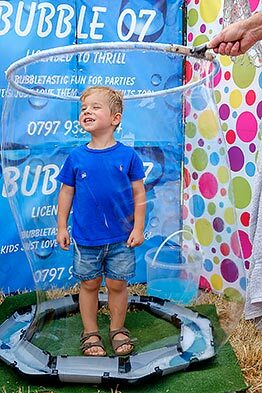 He had previously contacted Dr. Zigs, a bubble company in Bangor, and it was them who invited him to this year’s Bubble Daze Festival and World Record attempt held over 3 days in Caernarfon. Russell can be contacted by telephone at mobile number: 07979382374. The Playground At Theydon finally celebrated its Grand Launch day on September 8th, there had been an earlier opening on 15th July as reported in Village News, but this finally just had to be a preview for those who made donations as the full ceremony that had originally been planned for that date had to be postponed as the work had overrun slightly meaning it had not passed its RoSPA inspection by then. The playground was though open for business by the start of the school summer holidays. This latest event was really for children who will be using the playground now it is refurbished, as the equipment can now be used safety. The fair was on a smaller scale than originally planned as the playground had been open for two months already but it was still deemed a success nonetheless. The fair was organised by the playground at Theydon Association - a voluntary committee of parents whose passion and dedication to see a much-loved but run down space reinvigorated was realised this summer. 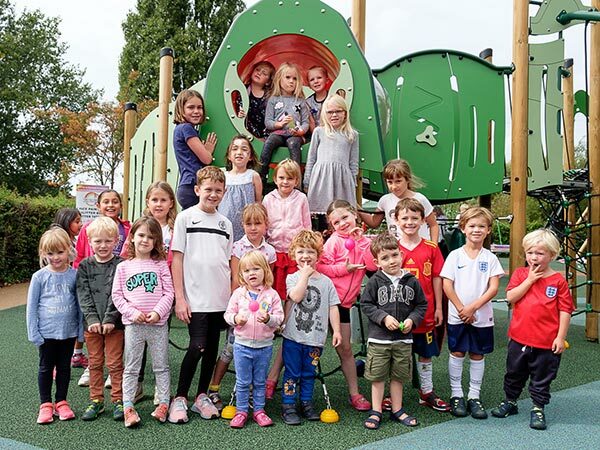 The official opening event marked the end of the two-year campaign to raise the funds to pay for the refurbishment of the playground at the corner of Poplar Row and Green Glade. To give the fair a boost there was music provided for free by Theydon DJ Tony Poole. There were also homemade cakes, drinks, and stalls including the Nerf gun shooting gallery, smack-a-rat, funky balloons, a penalty shootout, tattoos and funky hair colours, crafts and hook a duck. There were prizes a-plenty and the cost to play on the stalls was minimal as the event was more to say thank you to the community for their support during the campaign as opposed to raising money on this particular occasion. Although the money raised will now fund the installation of a new notice board in the park. The PAT committee - who maintain, fund and clean the bins at the site - received some lovely feedback on the day from parents and their children who were enjoying the new facilities. If anyone would like to join the PAT team, please contact Shelley at dixs@rpsgroup.com for more information or come and speak to one of them at the Christmas market. Further details of the book club and the remainder of the 2018 programme are on the Club Details Page. At last night's October Monthly Parish Council Meeting it was announced that the Parish Council is to approve proposals from the Parish Council Community Liaison Committee for its own Parish Council Website. The setting up of this new website will be outsourced to a private company, and financed and run by the Parish Council in conjunction with the new provider. At this stage we have no further information so are not sure when the new website will be in place or how this will affect the Parish Council Pages on this 'Theydon Bois Village Website' or this website as a whole in the future. 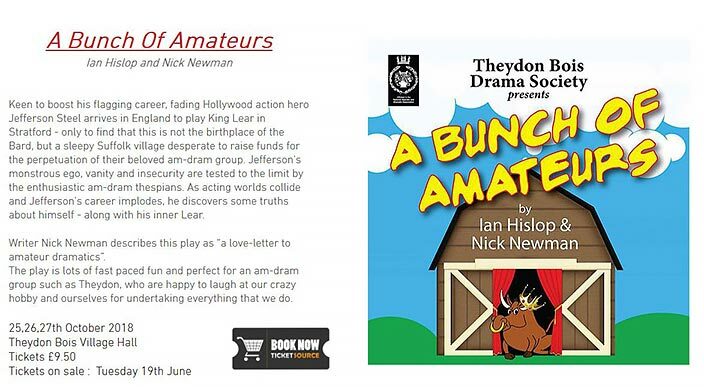 At present this website and the Parish Council section are run by 'Theydon Newsdesk' volunteers. More information will be given when available. This is a special event in coordination with others across the country. 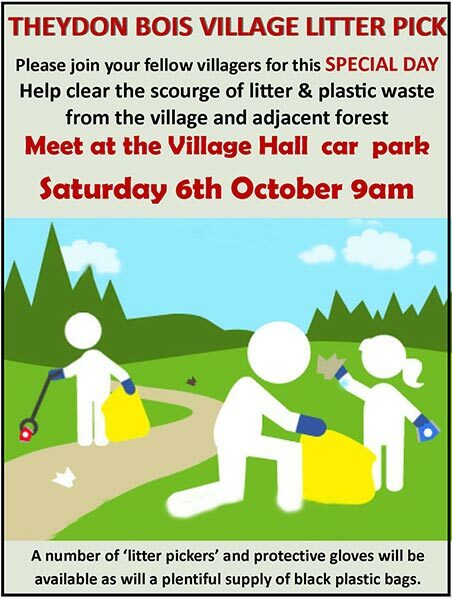 Please come along and help clear the scourge of litter and plastic waste from our village and the adjacent forest. Most equipment will be provided. The Local Plan, a set of policies to manage development within Epping Forest District up to 2033, has been submitted for approval to the Planning Inspectorate by Epping Forest District Council. The news was announced by Planning Portfolio Holder John Philip at the meeting of the Full Council on Tuesday 25 September 2019. Submission followed the end of a legal challenge by property developer CK Properties (Theydon Bois) Ltd after its application for leave to appeal to the Court of Appeal was refused. CK Properties had already lost its case following a High Court hearing. Although the Council was successful on all four grounds in the judgment given by Mr Justice Supperstone on 29 June 2018, an injunction continued to prevent the Council from submitting the Local Plan to the Secretary of State for examination until the conclusion of the legal proceedings – this included the subsequent applications for leave to appeal made by the claimants. The full story is here on the EFDC Website and our website Pages about the Local Plan and how it effects Theydon Bois are is here. 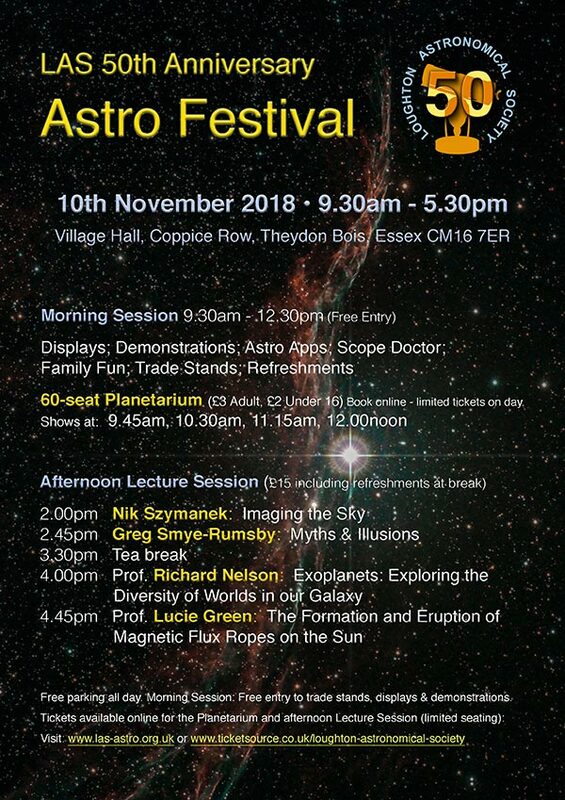 The Loughton Astronomical Society is holding its 50th Anniversary celebrations at Theydon Bois Village Hall on Saturday 10th November 2018. Residents and families are invited to join us; the day will start with displays, demonstrations of family orientated astronomy and an indoor planetarium in the morning. The day continues with lectures from top astronomers in the afternoon. Originally formed from an evening class to teach mirror making, the LAS moved to Theydon Bois 20 years ago for the dark skies. It continues to thrive with an active weekly programme and supports the AstroKyds junior section, which has been going for 19 years in the village. Please visit www.las-astro.org.uk for more details and the opportunity to purchase tickets. you like with 3 films to choose from. of the boldest voices in contemporary cinema. grappling with existential questions. Narrated by Benedict Cumberbatch. Rogers/Fred Astaire classic, Top Hat and marvel smash, Black Panther. Any remaining tickets will be available to buy 30mins before the screening (cash only). and it is a less than 5 minute walk from the High Street bus stops. As the days get shorter if you work away from home, or even pop out to get the children from school by the time you return home it may already be dark. A house in darkness says no one is in especially if your neighbour’s houses either side have lights on and show other signs of being occupied. If you back onto open farmland or have parking areas or footpaths to side or rear this may be even more apparent. Create the “Illusion of Occupancy”, when its dark make your home look like you are in. Leave lights on or put them on timers or daylight sensors to come when it gets dark. Remember though no one lives in the hall or on the landing so if you leave these lights on supplement these with lights on in rooms that you would normally occupy at that time of day i.e. lounge and kitchen. A carefully placed imitation TV or “Fake TV” can further add to that illusion of occupancy by making it look like the television is on. Some burglars may also listen at windows or letterboxes for sign of activity, so consider leaving a radio on within your home. Support your local team this autumn season at their home ground on the Cricket Ground site off Loughton Lane or Avenue Road. All are welcome and there is a friendly Club House Bar. Unfortunately as the improvement works on the playground are running a bit behind scheduled the Public Opening of 'The Playground At Theydon' that was due to take place on Sunday 15th July has had to be postponed. There will still be a small 'Ceremony' for the contributors to the refurbishment and VIP as it was too late to cancel this after invitations had gone out. The Playground will now be open to use probably by the beginning of August and the official Public Opening will now take place in September. The date for this is still to be confirmed. On Wednesday 27th June, the first Community Cuppa event took place in St Mary's church hall. Running along the lines of a youth club but for adults, villagers, Lisa and Karen, explained that this trial run was to gain feedback and assess interest. "From other activities we have been involved with, Soup Lunches, tennis club, learning the ukulele, we kept hearing people say 'we wish there was a more regular opportunity to get together in an open, stress-free environment'. We're hoping this could be it! We have just started the ball rolling. It's for the people that come to shape the initiative as they wish." When I walked into the hall, the tables and chairs were laid out very informally, fresh flowers on every table. The kettle was brewing and a magnificent array of cakes were on display. A selection of table games and activities were dotted around for those interested including, for the particularly active, table tennis, boules and badminton in the garden. After a nail-bitingly slow start, people started to arrive. "It's amazing how many people you don't know! ", said one. "If you don't have children you can miss out on friendship opportunities", said another. Some people were extremely nervous, walking into a hall on their own, but they were brave and they did it. By the end of the morning, four people had swapped details and one signed up for another activity in the village. It was also really good to meet Kim, our new Neighbourhood Watch Coordinator and she had a chat with everyone. "That's what it's all about", said Lisa and Karen, "building community". Community Cuppa starts properly on the last Wednesday of every month from September. 10am-12pm, St Mary's church hall. It is a not for profit initiative, charging a nominal £1.50 to cover basic costs. Please contact us with your Latest News. 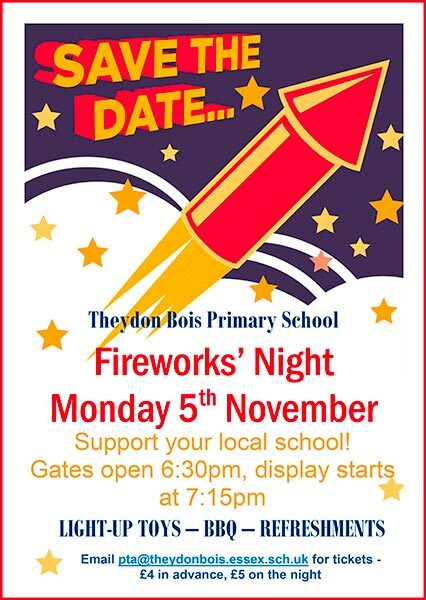 E-mail: Theydon News Desk . or send copy to the Village Office.